An honour Roll lists 60 service personnel who served in World War One. Empire Day was celebrated at the Richmond State School, a large number of parents and friends attending. The flag was saluted and the children gave their Empire Day pledge. 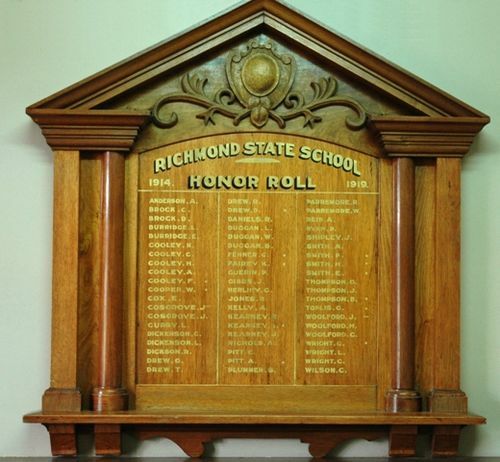 The school honour roll was then unveiled, and the names of 60 old scholars who went to the front were read out by the, Warden (Mr. R.S. Grice). The flag was then half-masted, and the names of those scholars who made the supreme sacrifice were read by the head teacher (Mr. F. R. Cooley), and the children repeated- "For these were great men and their name liveth forevermore." The "Recessional" was then sung by the gathering.